I wonder what other fish see when the red snapper is down deep in low light conditions. I am sure there are scientists who could tell me, but the human eye can’t discern color well in low light conditions, such as many hundred feet below the water, under some rig in the Gulf of Mexico. Surely those fish can discern what humans cannot at those depths. 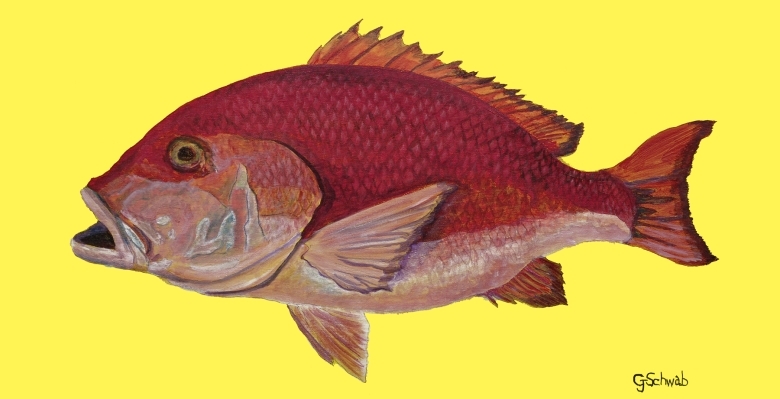 Why else would God have created the Red Snapper in such a brilliant hue of red? For whatever reason, I am glad that he spent the time on this species - getting it just right so I could marvel. Chris Ibert of Franklin, Louisiana speared the model of this specimen off the coast of South Louisiana in 1988 and it was the then spear-fishing North American world record at 54 pounds. Sometimes it takes a little guts to cast out into the deep, but that is where both wisdom and lots of pearls, like this red snapper can be found.